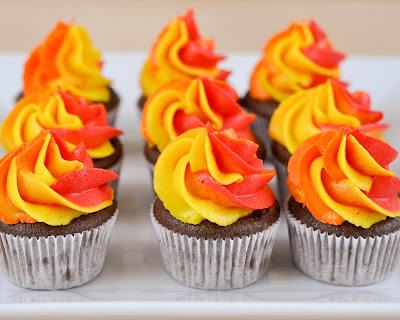 These little cupcakes look a little bit like they're on fire, but the cool striped swirl effect they have is really fun, and really easy to do, too. -- Click this link to see how to make them in Icing Bag Bullets. If you have never made an Icing Bag Bullet before, you'll want to check out this tutorial. 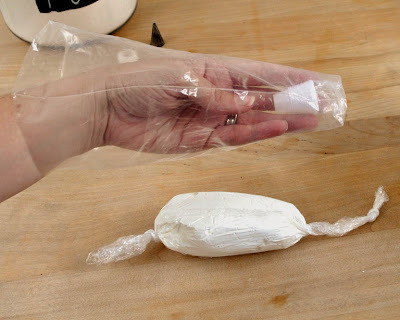 In short, you wrap icing in plastic wrap to keep cleanup easier. 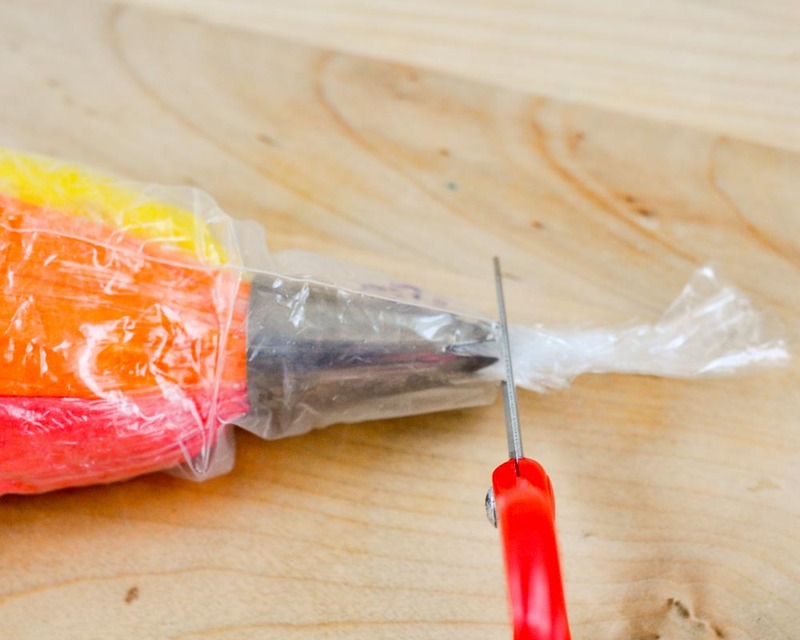 To make striped icing, try to make your bullets as long and skinny as possible. The skinnier they are, the easier it will be to get it loaded into the bag. Lay two or three bullets side-by-side, and twist the open end of the bullets together, as you see in the photo above. If you're doing cupcakes, load the Tip #1M into the bag without a coupler. Scrunch the bag down so that it is around the tip. 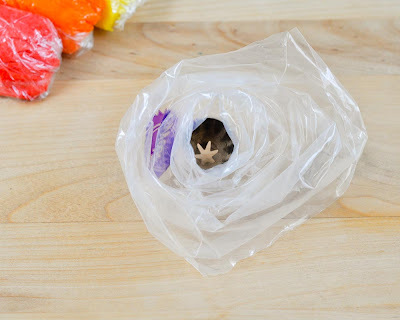 The plastic wrap will stick to disposable bags, so getting the bag as scrunched as possible makes it easier in the long run. 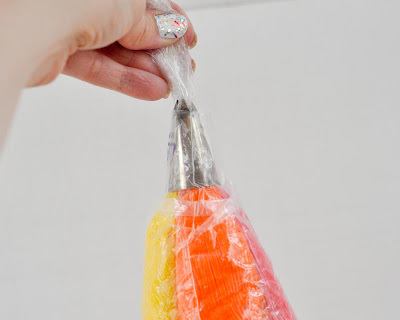 Thread the plastic wrap through the tip, being careful that all two or three bullets thread in the same place. Cut the plastic wrap by pushing the tip inside of the bag a bit. 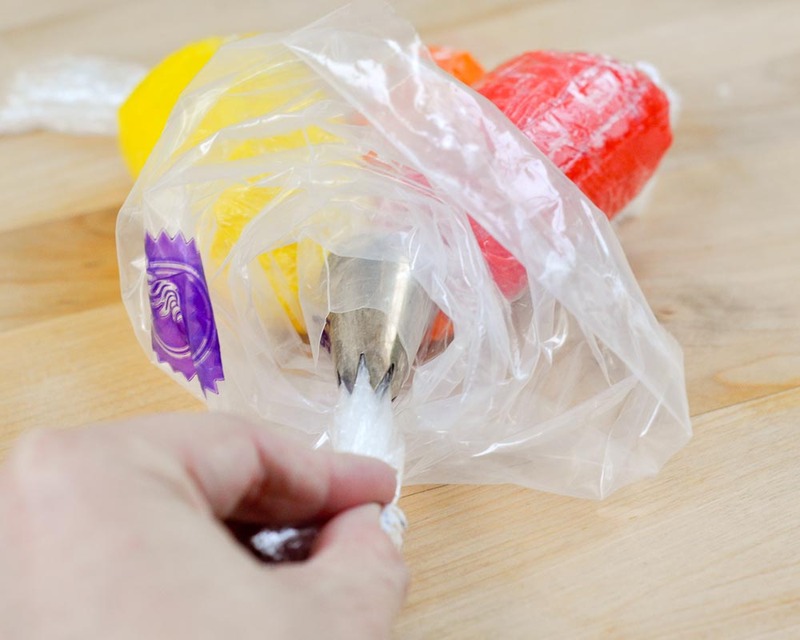 When you pull the tip out, you want to be sure that no plastic wrap extends past the spokes of the tip, or you won't have a pretty swirl. 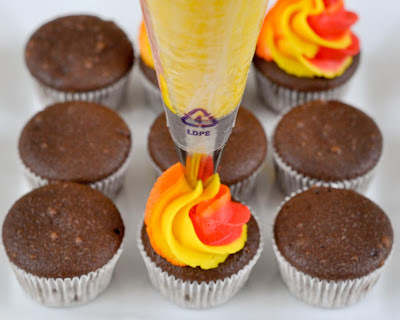 Squeeze the icing on to the cupcake. Know that the first one or two will not be as swirled as the rest because the icing doesn't all come out perfectly even... at least not in my life. If you've never made a Cupcake Swirl before, you can find the complete tutorial here. Wow! I always wanted to learn how to do a multi colored swirl! This is great and very informative- thank you! Beautiful cupcakes! My son loves fire engines and we have a fire engine cake pan that I want to use for his birthday this year, but it's kind of small so I wanted to add something more. These fire cupcakes would be perfect! Thank you for such a great tutorial too! I tried to recreate your tri-color swirl with the individual bullet bags (great idea! 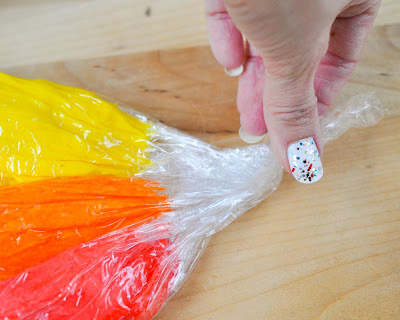 ), and while I was creating the bags, had just a little bit of the three colors left over, so Iined them on the cellophane and made them into one bag. 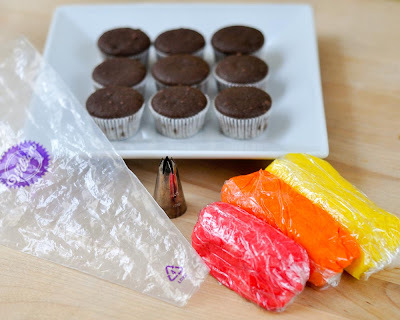 I found that it was actually easier to create one bullet bag that had all three colors in it--particularly when I was icing my mini cupcakes. Thanks for the tips, though! It was a good starting place and I've been dreaming about your masterpiece cupcakes for weeks hoping that mine would look as good. :)!